There was a library in the back of our Kingdom Hall that contained some very old books that were published in the era of the founders of the International Bible Students / Jehovah’s Witnesses: Charles T. Russell and J. F. Rutherford. I used to love thumbing through them mostly because I loved old books, but secondly some of them were really very odd in nature. I am assuming from what I have heard from others is that these books have been removed from their libraries. You cannot get them online from the Watchtower Organization itself. For good reason I suppose. I think it is safe to say that many current Jehovah’s Witnesses have no clue about the information or the many prophecies in these old publications and if they do they are told that researching or questioning is an act of disloyalty to Jehovah’s Organization (see The Watchtower, January 15, 1983, pp. 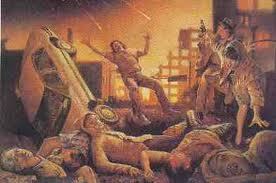 22, 27 and The Watchtower, May 15, 1984, pp. 17-18). But what about what the Bible tells us in 1 Thessalonians 5:20-21: “Despise not prophecies. But prove all things: hold fast that which is good”? And what of the Bereans who were careful to make sure that what Paul was telling them stood up to the scriptures? (Acts 17:11) Were they displaying disloyalty to Jehovah or were they actually proving themselves loyal to Him by making sure that what they were being told was in accord to the Bible? Every preacher should expect his doctrines to be examined in this way, and to be rejected if they are not in accordance with the Word of God. — Barnes Notes on the Bible. The Bible never states that Paul took affront to the Bereans questioning or told them that they were being disloyal. As the Watchtower Organization considers themselves to be modern day prophets Watchtower 1972 Apr 1 pp.197-199 ‘They Shall Know that a Prophet Was Among Them’ Wouldn’t it be a wise thing to make sure or to prove to yourself that you are not following a false prophet? God’s Truth does not change. God’s Truth does not fear examination. Whom do you obey? God or Man? This statement had a deep impact on me. Is that the way they think about Jesus? Don’t they know about his ministry, his death? Surely, they must. I also was already having a hard time connecting the message of Jesus and the coming Kingdom. Well, when I started attending church I was happily surprised to find that these people weren’t talking about Jesus the baby all the time. They talked about his ministry and his healing. His death for our sins. Yeah, they did talk about him as a baby during Christmastime, but included in that theme was what his birth really meant. To me the Good News is really lost in these doomsday messages. Too much focus is put on the hidden messages of the bible. Focusing in on dates and times. I truly love what Alistair Begg says “The main things of the Bible are the plain things and the plain things of the Bible are the main things”. One of the plain “things” of the Bible is God’s plan for our Salvation through Jesus Christ. Yes…I know I said I was going to limit my posts to twice a month, but I felt the urge to share this morning 🙂 … forgive me. *Christendom: A term used by Jehovah’s Witnesses for those belonging to any religion outside their own. For the average Joe it might be hard to understand how a person can remain so “brain chained” long after departing an organization like The Watchtower. I am so bad at calculating how far back something actually occurred — I had to get out my pencil yesterday and figure out exactly how long it took me to find the key. 28 years. It’s not even that I still believed in all their teachings, I didn’t. But in the back of my mind somewhere deep and buried…it was still the “Truth”. My husband and I had worked up the bravery to start attending a local church when our daughter was about 2. However, for me, the chains didn’t let go until about a year and a half ago. My brother (who had recently disengaged himself from the organization) lent me a book written by Raymond Franz entitled Crisis of Conscience. Franz a former member of the Governing Body of Jehovah’s Witnesses, had started questioning the tactics and teachings and was subsequently disfellowshipped himself. This book rocked my world – “Oh, my God, it’s a freaking cult!” I remember texting my brother when I was only a quarter of the way through. I literally read this fairly large book in one afternoon. After I read it I began to tearfully pray to Jehovah in earnest to show me the way. This was the first time after all these years that I honestly felt that God would accept a prayer from me. In addition to doing internet research on the history of the Watchtower, I started reading the Bible, listening to Christian podcasts, and making numerous visits to the Christian bookstore. Comparing and contrasting what I was now learning against what I had learned in my previous life as a JW. I had (and still do) lots and lots of questions. But I am finding my way slowly. The dear truth I hold on to now is that Jesus is my Savior, and his Grace is beautiful and transformational. It’s sad to know how spiritually damaged this organization leaves people. I know some who can no longer believe there is a God. I understand how they come to this decision after the treatment they have received. I find it quite disheartening that there is really no local resource or Christian outreach to minister to folks like myself. I feel compelled to do what I can in this area even though my toolbox is a little empty right now. Thank you for reading my ramblings. (Which I’ll try to keep down to a monthly or bi-monthly basis hence forth.) I hope to include some links and resources that I found that were helpful to me in my next posting. When you are a Jehovah’s Witness you don’t celebrate birthdays or holidays. There is no Christmas, Halloween, Thanksgiving, Easter, 4th of July. Nothing, nada (except maybe wedding anniversaries – those are allowed for some odd reason). My mother, who was raised a Congregationalist and converted to a Jay-Dub a little before I was born, must have determined that she wasn’t giving up that Thanksgiving meal even for Jehovah. So every year, a week after the real Thanksgiving, we would have our own Un-Thanksgiving. The meal was complete with home-made stuffing, pumpkin pie, and cranberry sauce – the works! I say Un-Thanksgiving because really the only thing missing was the “thanksgiving” part. I think if the brothers had found out about this we would all have been sitting in the back row of the Hall for quite a while. Funny, none of us ever let this little secret slip-out somehow. The only holiday I really ever regretted being excluded from as a kid was Halloween. I love fall, the smells, colors, and pumpkins – oh, how I wanted to make a jack-o’lantern! 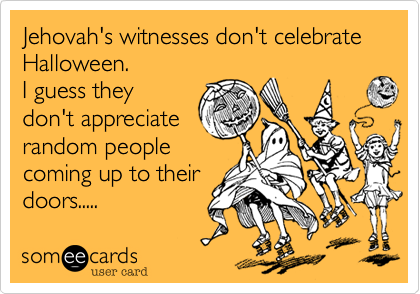 But since Witnesses are so afraid of the devil – Halloween was definitely a no go. We would turn out the lights and sit in the dark, not answering the door when the trick-or-treaters came. There is always a little bit of good that comes out of the bad and I’m guessing all of this is one of the reasons I love going to the library so much . . .
. . . It was the only thing they knew to do with me at school when it came time for class birthday parties; Halloween parties and crafts; birthday parties; Christmas parties and crafts; birthday parties; Valentine’s parties and crafts. . . When I was about 20 years old, I was disfellowshipped from the Jehovah’s Witness religion. Without going into too much detail I can tell you you, admittedly, I deserved it. I am a sinner. I confessed my sins to the elders while sitting on one of those ugly metal chairs in the back room of our congregation. Maybe it was not being able to see myself enduring the months or years of silence and stares from stone cold faces, the whispering or sitting by myself in the back row of the Kingdom Hall until they deemed I was repentant enough or punished enough to be granted forgiveness. Maybe it was the questions I had in the back of my mind about Watchtower teachings. Maybe it was a combination of things. Whatever it was, I made no attempt to go back. My choice meant I was doomed to die at Armageddon. All those hundreds of images of dead and dying non Jehovah Witnesses: my fate. I left Jehovah’s organization and that was that. Friends, family — in their eyes I was dead. I was more fortunate than a lot of DF’d people. I had my sister Mary (who left the “truth” a few years prior) to lean on and shortly thereafter, I met my husband. I began to live a seemingly normal everyday life. It doesn’t matter how many years go by or how much of an attempt you make to walk on a narrow path. That shame and the fear is always present with you. Hovering. A bad thunderstorm, 911, the sniper . . .
Why just saying, “I’m not interested” is missing a great opportunity to share Jesus. A moving clip reminding Christians why it is important to reach out to Jehovah’s Witnesses. I have been reading and re-reading the gospels over the past several months, but a few mornings ago the passage in Matthew 2 ‘The Visit of the Wise Men’ stopped me in my tracks. To many Christians, this is a predominant feature in their remembrance of Christ’s birth. To me it just brings to light the many untruths I was fed about Christ as I was growing up as a Jehovah’s Witness. I was told the star of Bethlehem was Satan’s star and that the wise men were led by Satan. Well, If the star of Bethlehem was Satan’s star, then Satan surely messed up. He should have sent the star to direct Herod not the wise men, don’t you think? The wise men came to find Jesus to worship him. Their gifts of gold, frankincense and myrrh most likely financed Mary, Joseph and Jesus’ escape to Egypt. Satan’s star? No way! This (among other things) has prompted me to share my story. A story about what it is like to have grown up in a cult (or fringe religion if you prefer) and my journey towards finding Christ. Maybe it will help others who are trying to unhinge themselves from the Watchtower organization. At the very least, it might help you to plant a few seeds of “truth” when those Witnesses come knocking on your door.